Wesel is in North Rhine-Westphalia, Germany. It is the capital of the Wesel district. Wesel became a target of the Allied air forces particularly in its capacity as a strategic depot. Many Germans headed for the Western Front passed through Wesel, using the bridges to cross the Rhine into France. 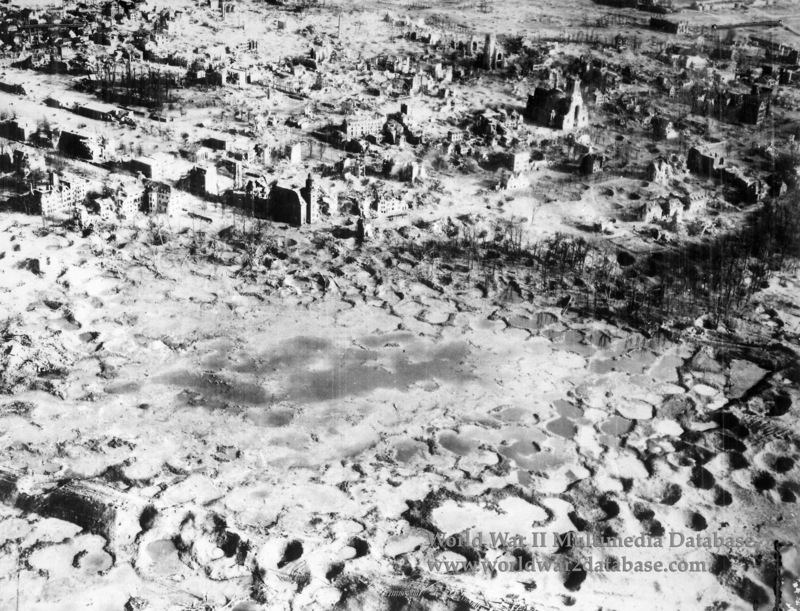 The German town of Wesel was devastated in Allied air raids. As the Allies prepared to cross the Rhine and enter Germany in 1945, the Royal Air Force (RAF) attacked Wesel on February 16 (100 Lancasters of No 3 Group), 17 (247 Halifaxes, 27 Lancasters, 24 Mosquitos - of Nos 4, 6 and 8 Groups), and 19 (168 Lancasters of No 3 Group carried out an attack in the railway area). On March 5, 1945, the 116th Panzer division withdrew across the Rhine and detroyed the Rhine bridge behind it. The Germans blew up the Lippe Bridge and the Rhine Railway Bridge, the last in German hands, on March 10. As preparation for Operation Plunder, 3,000 artillery pieces concentrated on Wesel. On March 24, 195 Lancasters and 23 Mosquitos of Nos 5 and 8 Groups made the last raid on Wesel. British Commandos entered and captured the town the next day. 97% of the town was destroyed; the population had fallen from almost 25,000 in 1939 to 1,900 in May 1945. Wesel, an ancient city, was rebuilt in the 1950s.